PE70A4000 is a programmable attenuator from Pasternack. Our SMA attenuator is a programmable step attenuator design. This 50 Ohm adjustable attenuator is precision manufactured to RF and microwave industry specifications. The Pasternack	programmable attenuator has a female gender for connector 1 and a SMA female for connector 2. PE70A4000 programmable step attenuator has a minimum attenuation of 0 dB and a maximum attenuation of 31.5 dB with 6dB step sizes. Our programmable RF attenuator has frequency range of DC to 13 GHz and a maximum VSWR of 0. 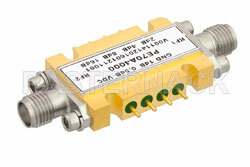 This adjustable SMA attenuator is rated to 0.16 Watt at the stated attenuation. Our attenuator PE70A4000 is shipped from Pasternack's ISO 9001:2008 facility the same day as purchased. 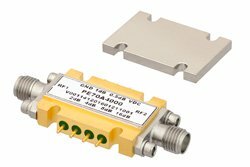 This RF programmable attenuator is part of over 40,000 RF, microwave and millimeter wave products that ship the same day worldwide, including custom cable assemblies.